RPM-USA (Revenue Performance Management) - Improved Performance leads to Increased Revenue!!! between Sales Analytics and Performance improvement. RainMaker Software by RPM has proven to be the MISSING LINK between Sales Analytics and Performance improvement. The primary objective of the RainMaker solution is to provide a system that can result in individuals and teams reaching their performance potential. It doesn’t matter if you’re a Software Sales Professional, Real Estate Agent, Recruiter or Consultant, improved results happens quickly. How? Here is a snapshot of some of our products and services. Sales organizations worldwide are using the RPM Dashboard to their advantage. The RPM Dashboard helps Sales professionals reach their sales potential by being the link between Sales Analytics and improved performance. The RPM Dashboard then shows the individual and team the progress through a series of weekly Graphical Dashboards showing them their past improvement and their improvement path forward. But the Secret is this. The RPM Dashboard is the missing link to Potential. How? It gives indiviudals and teams weekly Video and Written training and development on their skillsets that need development. The RPM Dashboard is the only perpetual training and development systems based on weekly Sales Analytics on the market today. Improvement never have to stop. Rookies love the RPM Dashboard as it helps them get up and running in half time. Senior Sales team members crave it because they realize that small tweaks in skills set can sometimes double or triple revenue. Sales Management now has a system to do actual coaching again and see the improvement day by day. Set your Sales team up on a test drive of the RPM Dashboard today. Is there enough volume to be successful? What skillset areas need improvement to immediately increase revenue? Recruiting and Staffing organizations from Europe to Australia to North America are using the RPM Dashboard to grow their revenue and per desk averages. The RPM Dashboard helps Recruiting and Staffing professionals reach their sales potential by being the link between Sales Analytics and improved performance. But the Secret is this. The RPM Dashboard is the missing link to Potential. How? It gives individuals and teams weekly Video and Written training and development on their skillsets that need development. The RPM Dashboard is the only perpetual training and development systems based on weekly Recruiting/Staffing Analytics on the market today. Improvement never has to stop. Rookies love the RPM Dashboard as it helps them get up and running in half time. Senior team members crave it because they realize that small tweaks in skills set can sometimes double or triple revenue. Set your team up on a test drive of the RPM Dashboard today. To get your team on the path to reaching their performance potential, the RPM team has a host of services to help you cross the finish line first. From just getting your team up to speed and on the track to Formula One training and development to Telemetry style remote coaching and management. Consulting Services: Needs Analysis, Initial Setup, Sales Cycles defined, Metrics Identified and best practices for all levels in operating the RPM Dashboard the most effectively. Training/Development – We have a host of training and development services both in house and remote on helping you and your team get up to speed the quickest and maintain a top performing team ongoing. From Metrics to Business Development to Marketing best practices. Remote Team Management – Need someone to help drive the team to greater production? We have sales and recruiting leaders with over 20 years in leading high technology teams to record breaking sales performance that use the RPM Dashboard as the basic infrastructure for weekly or monthly coaching and development. Remote Coaching – If more individual attention is needed to improve specific items, We at RPM have some of the best coaches worldwide that focus on the Sherpa Methodology of Executive coaching. The two best methods of performance improvement worldwide include one on one coaching and small group coaching. Reach out today to explore the possibilities with you and your team. Watch this free demo to learn all about RPM, its unique features, and how it can revolutionize your success! I've spent close to 50 years in the recruiting industry. I've worked with thousands of recruiting firm owners - the most successful ones consistently had a system for monitoring the metrics of their business. I've seen many systems - the RPM Dashboard establishes a whole new standard. It is the finest and to me, the seminal tool to giving recruiting managers the visibility to make the business decisions that are crucial to the success of their business. In my opinion, every recruiting firm globally will benefit through the RPM Solution and partner program. Co-Founder and Chairman Emeritus, Management Recruiters International. Absolutely Amazing ! The NEW RPM Mobile Dashboard system helped me to set my goals, reconstruct my daily and weekly activities, rebuilding my day to day focus and performance from the ground up, actually pushing me to focus on money making activities. In less than 28 days I went from zero to 75K in fees and generated a solid 200K in send out pipeline. I also have retained and exclusive searches that total to more than 200K. Thank you Jon Bartos and the RPM Team! Global Infrastructure Recruiter - Manchester, U.K. Growing a recruiting firm in this economic environment is difficult. Growing a recruiting firm without sound Business Intelligence to make decisions is like sailing a boat to china without a compass. The RPM solution is the most effective solution available that allows for company owners and individual contributors to get the information they need to perform. Don't just invest in the RPM Dashboard, use it religiously to increase your revenues and increase the predictability of your income streams. Founder and CEO, The Recruiter University. I have been teaching recruitment for over 32 years. During that time I differentiated between knowledge deficiencies and execution deficiencies. I always told my recruitment students that I was responsible for the left side of the equation - the knowledge deficiencies. And that they were responsible for the right side of the equation - the execution deficiencies. They had to pick up the phone. They had to implement the knowledge. Now I occasionally touched on the right side of the equation with certain monitoring devices, but not often. That was left up to the individual students. Then, just recently, Jon Bartos (who I greatly respect and who I worked with on the revised 'Job Order Matrix') introduced me to his new "RPM Dashboard". When I first saw it, I thought it was like seeing all of our past monitoring devices on steroids. I immediately liked Jon's new approach in that it tackled the often neglected execution deficiencies side of the equation. I am sure that others will like it as well. But more important, will profit when they implement it. Jon's final stroke of genius was to asked the top recruitment teachers in the industry to be involved in his project as 'certified coaches'. The bottom Line - The RPM system will help you make, and save, more money! In medicine, prescribing without first diagnosing is malpractice. The same is true in the recruiting industry and the only way to effectively diagnose and prescribe is to track relevant data for each professional in the office. The data and resulting ratios provide incredible insight and opportunity for meaningful coaching. 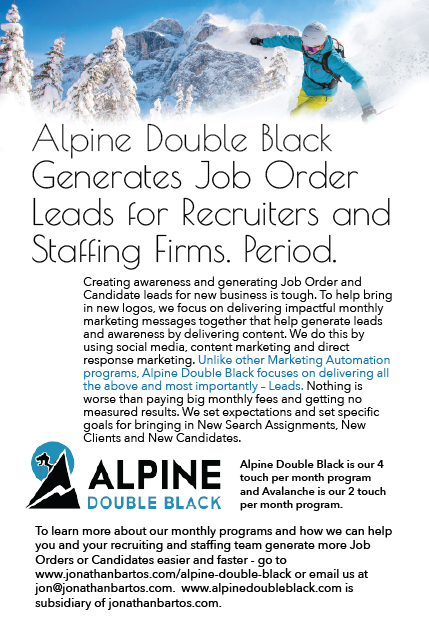 Finally an easy to use product/software has been created that can provide the ability to track, monitor, and analyze a recruiter's performance in real time. What an EKG is to the heart, RPM is to the heart of a search firm. 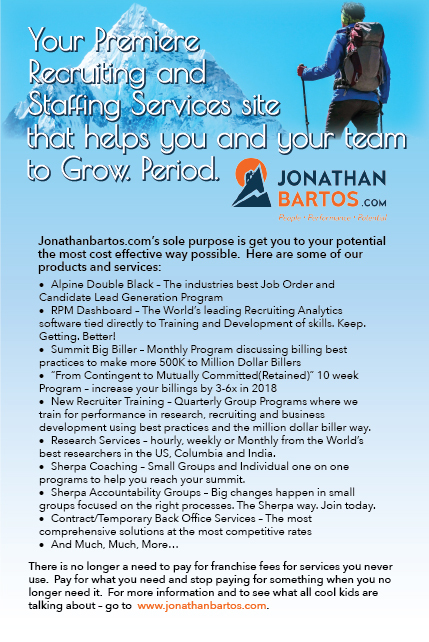 Jon Bartos is a pioneer and visionary in the search industry and no surprise that he has created this incredible tool for our industry. CEO NEXT LEVEL EXCHANGE AND KAYE/BASSMAN INTERNATIONAL. If you want to go faster - you need more RPM. To get more RPM, you need accurate and timely data. This easy-to-use data management tool is simple and informative. You can quickly gauge your key metrics and trends to make adjustments as needed. All Sales People need an occasional coaching "tune-up" and this systems provides great content for that coaching moment. When used correctly, RPM will be the best tool in your Toolbox. President, Bauer Consulting Group, Inc.
©2018 RPM-USA. All rights reserved.